Collapsible PE Traffic Cones are placed on roads or footpaths temporarily as a mean to redirect traffic safely. They are often used to create separation or merge lanes directing road users to "Stop-Check" operations by traffic police or during automobile accidents. Display : Collapsible PE Traffic Cone in full extended state approximate 670mm (H). 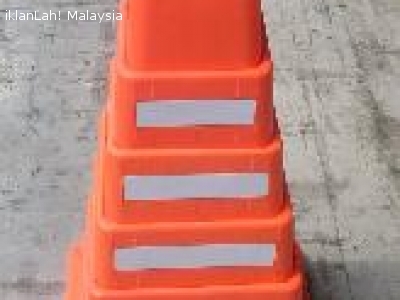 Collapsible PE Traffic Cone 600mm height x 300mm base width market and sale by Flexijoint Industrial Marketing & Services, Kuala Lumpur, Malaysia. For further enquiry, please contact us at T: +6 03 79541136 M: +6 016 3111313 F: +6 03 79808259 E: flexijoint.ims@gmail.com.